It is believed that when wisdom cannot be found in the chambers of parliament or at the halls of political elites, academicians become one of the many voices of reason as they are renowned for their zero tolerance of unusual characters, corrupt practices and an institution that eschews evil in all its forms. 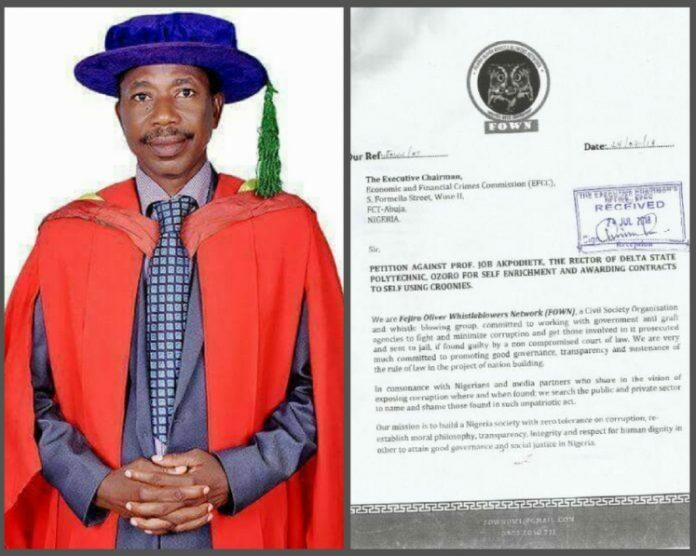 Professor Job Akpodiete, the Rector of Delta State Polytechnic, Ozoro appears to have abandoned his role as an academician in servicing the status quo of accountability and transparency in Nigeria and impacting it into the younger generation but has rather conformed to the carrot of evil dangled before him thus earning a degree as a professor in looting. A source knowledgeable with the activities of the rector revealed to SecretsReporters that the rogue rector Job Akpodiete in a bid to enrich his pocket and enlist into the elite group of looters in Nigeria, awarded a contract for the construction of a guest house at an alleged jaw-dropping cost of more than N200million to Engr. H. I Akumune who is purported to be his proxy, without following due process or adhering to the Delta State Procurement law and has disbursed over N90million towards this fraudulent project. 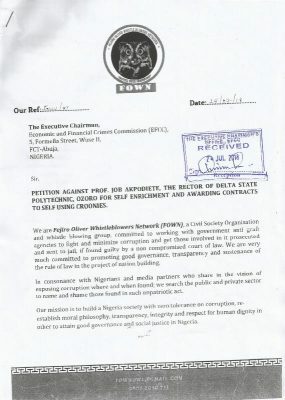 Our source also disclosed that the Rector and the management of the school are massively involved in contract racketeering running into hundreds of millions of naira, as well as frequently recruiting both academic and non-academic staffs without respect for the extant laws that govern such exercises in Delta State with most of the recruitments tainted with heavy ethnic sentiments. To further deepen the root of his financial recklessness with the sole aim of satisfying his gluttonous desires, Job Akpodiete on April 3rd, 2017 purchased three brand new vehicles from Mandilas Enterprises Limited, located in Effurun-Warri at highly inflated prices. It is purported that he bought a Camry 3.5 V6 Leather Seat Full Option for an over bloated N35million, a Corolla 1.8 GLI Leather Seat Salon for an outrageous N21.5million and a Corolla 1.8 GLI Fabric Seat Saloon for N18.9 million. Flexing his muscles of impunity, he went further to acquire a Toyota Hilux 4×4 Shell Spec Double Cabin Petrol at an inflated rate of N18.5million all with the polytechnic`s funds. In a bid to show his affluence from ill-gotten wealth, it is also alleged that in less than three years, Job Akpodiete acquired two new buildings worth hundreds of millions of Naira located at Robert Allor Street in Ughelli and Asaba respectively. 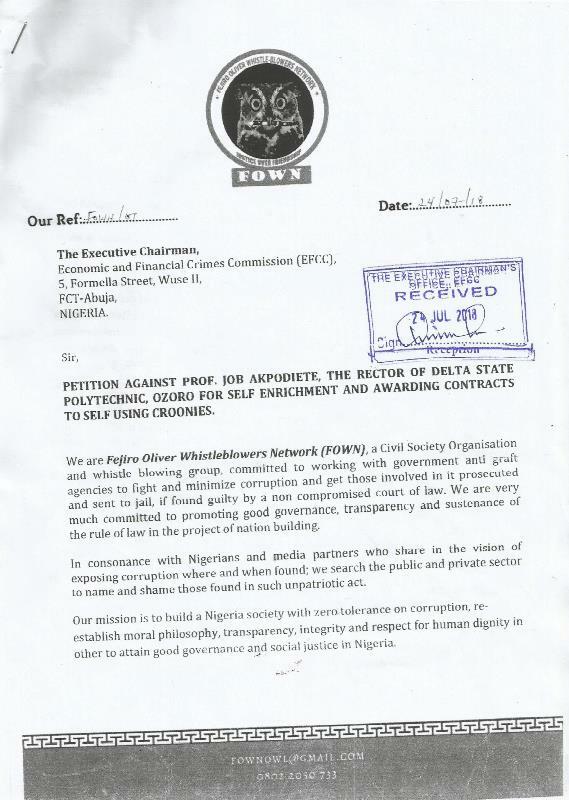 As corruption cannot be hidden for long, this online news medium also learnt from our reliable source that a dogged anti-corruption agency called Fejiro Oliver Whistle-blowers Network (FOWN) has filed in a petition to the EFCC and Special Presidential Investigative Panel (SPIP) to bring Job Akpodiete before the laws of the land and for all accounts of the Rector to be investigated as well as his many proxies, so as to salvage Delta State Polytechnic, Ozoro from the decay that has almost ravaged its foundation. The person in our possession called on the EFCC and SPIP to immediately seal up Akpodiete’s properties, gotten with the proceeds of illicit funds while prosecuting him and jailed if found guilty.